I have mentioned before that I am a total sucker for anything I can personalize. Maybe it comes from having a uniquely spelled name, so I always had to have things custom made, I don’t know. But what I do know is if I find a unique gift that I can personalize however I want… it is almost impossible for me to resist. That is what makes me such a huge fan of Initial Outfitters and their extensive line of jewelry, handbags, scarves and more! For the 2013 Diva Holiday Gift Guide, Independent Initial Outfitters Consultant Lynette Jeffres let me choose which piece I wanted… and I nearly did a little happy dance around the office when I saw the Mother’s Pendant medallion above. 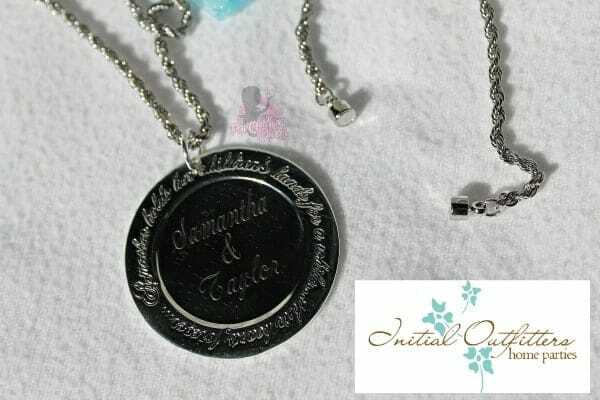 I have been wanting something with both girls names on it for ages, and this was absolutely perfect. It is large – the image above is me holding it in the palm of my hand – and I get compliments on it every time I wear it. Pictures simply can not do it justice. 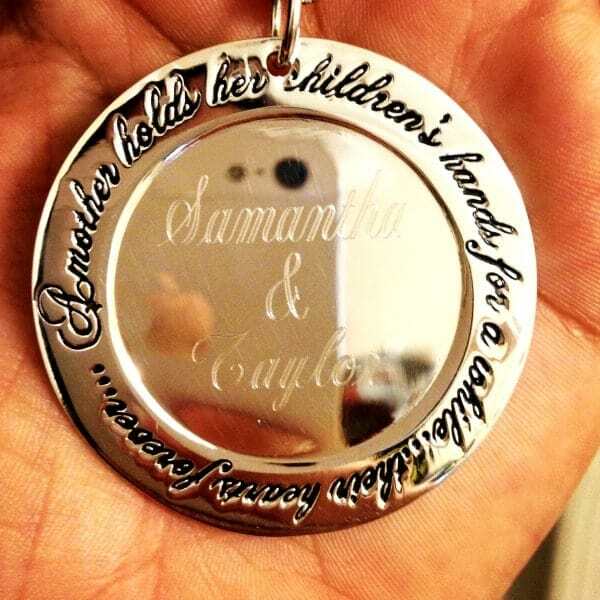 I chose a 20″ silver plated rope chain to go with the Mothers Pendant which compliments it perfectly. The chain also has a magnetic clasp – which made me immediately think of my Grandmother who has arthritis in her hands and struggles with putting on jewelry because of that. The silver plated rope chain simply needs to be held closely together and the ends almost jump together. To remove, give it a gentle tug. Voila. Since 2006 Initial Outfitters has been creating amazing products and offering a unique and generous opportunity for those wanting to own their own business. To see everything that Initial Outfitters has to offer, check out Lynette’s website.